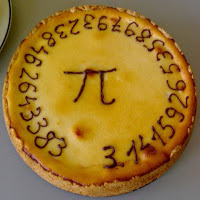 Physics Buzz: Happy Pi Day Everyone! Yayyy!!! Pi is perhaps the most important mathematical constant. It appears in various formulas throughout math and science in fields as diverse as physics, statistics, and sociology. Although pi is defined in terms of the geometry of a circle, most applications of this number do not directly involve circles. Pi also appears in many formulas not directly involving circles or spheres. For instance, the periods of all the trigonometric functions are either equal to pi or 2 pi. Although trig functions may be defined in terms of a circle, they are usually used in contexts not directly involving circles. Another place pi is widely used is in the normal distribution, which is commonly used in statistics, and data analysis within experiments. Uh, Pi is a transcendental number. Circumference of Circle / Diameter = Goba, 6283185306 / 2000000000 = 3.141592653 Constant of Goba is RATIONAL NUMBER. (i) (Circumference of a Circle / Diameter = Goba, 6283185306 / 2000000000 = 3.141592653 Constant of Goba). The Self - Proving Theorem of Goba and its Explanation on the Basis of a Formula. (ii) E=Mm² Which means Energy = Mass x (Speed of Mass)², Speed of Light = 22,32,00,00,000 Mile/Second. (Twenty two Hundred and Thirty two Cores Mile/per Second). (iii) 504,866,505,707,712,000 (Mile)³/Second The Extent of solar system. (iv) The Theorem of the Formula for the Explanation for the Creation of the Cosmos in the Large Hadron Collider Machine. (v) Point - The Theorem of Existence of Point and its Aspect. (vi) The Distance Between Shining Lightening as well as Thundering Cloud and The Earth. (vii) To do Research on the Research Done by Shantaram Bapurao Janorkar we Expect to Operation from World Educational Institute, Universities, Scholars, Scientists. Note: Hon. Sir, Please share this all of us. Akola - 444 404, (Maharashtra State), India.